This year at Baselworld, Oris launched a vintage-inspired dive watch based on a model they produced in 1965 resulting in a timepiece that is basically an upgraded contemporary version of the original. The new Sixty-Five Diver has a larger diameter steel case with a sapphire crystal, rubber strap, and modern movement. Its predecessor had a chromium-plated brass case with a plexiglass and a plastic strap. Visually, they are very similar, but functionally the new model is far superior. The case measures 40 mm in diameter by 12.99 mm thick. The length is approximately 47.5 mm, and the lugs allow for a 20 mm strap. It wears very well, sitting nice and flat. At 78.9 grams, it is very light, which also adds to the comfort factor. Overall, this watch is a great size for my approximately 7.5″ wrist. Oris has done an excellent job re-interpreting a timepiece from their archives by improving on all the areas that needed to be modernized while maintaining the look and feel of the vintage model. In-between the lugs and on the case flanks are polished, along with the crown. The top of the lugs are brushed, and the edges are straight (not beveled like on a Submariner, for example). Would have liked to see the beveled case edges, but I am sure that is one feature limited by the price point. Naturally, the crown and caseback are screwed in and sealed with gaskets. Water-resistance is not super deep, but 100 meters is more than the majority of us will ever need. On top of the middle case is the unidirectional 0-60-minute bezel with a luminous dot inside the triangle at zero (the original Oris 1965 diver had a bidirectional bezel). The bezel is in a black steel with a black aluminum insert. A domed sapphire crystal with an interior anti-glare coating protects the dial and gives the watch its vintage feel. The Sixty Five features a curved, black glossy finish dial with printed luminous indexes, and Arabic numerals at 12, 3, 6 and 9 o’clock. Inside of the hour ring is a white printed inner minute ring, similar to the original 1965 model. 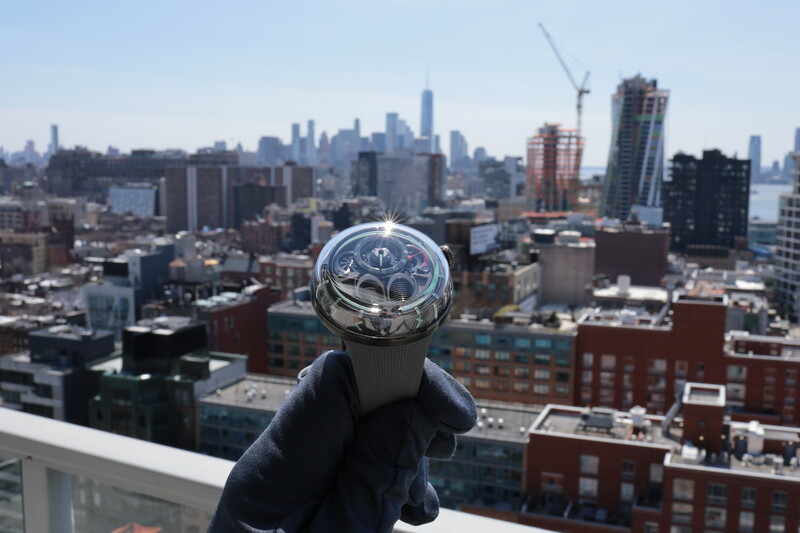 The baton-shaped hour and minute hands are nickel with a luminescent treatment. The lollipop sweep second hand also features luminescent paint. Practically hidden, just above the 6 o’clock numeral, is a small date aperture with white on black numbering, blended right into the minute track. With a trend towards no-date models, this is at least a good compromise. 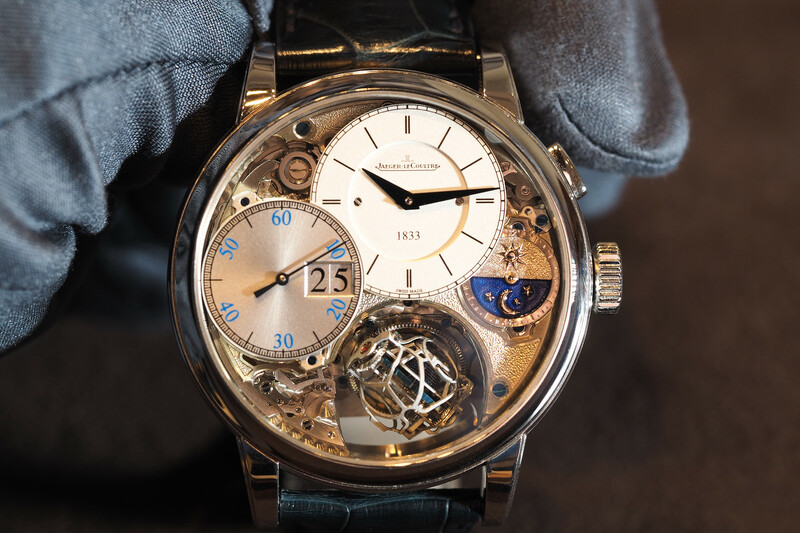 The original model has the date at 3 o’clock, causing the adjacent numeral to have to be reduced in size and throwing off the symmetry of the dial, as it does on so many other watches as well. Thankfully, for this modern version, Oris chose form over function and went with what looked best. The Sixty-Five is powered by Oris caliber 733 which is based on a Sellita SW-200 with date function. It is self-winding and is essentially a clone of the ETA 2824-2. 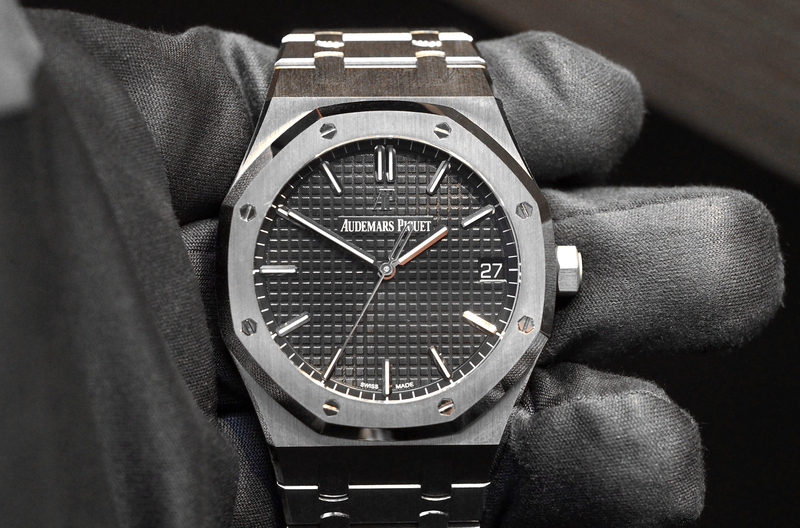 It beats at 4Hz, has 26 jewels and 38-hour power reserve with hours, minutes, central seconds and date. And there is a stop-seconds function and you can manually wind the watch if needed. Not an in-house movement but it is a reliable Swiss design that appears to keeps good time and is not expensive to repair and maintain. 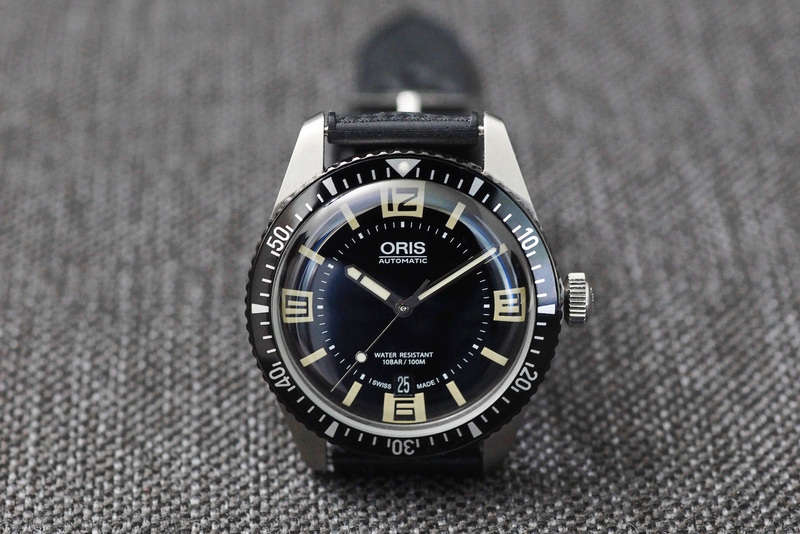 In 1965, the watch Oris was selling had a plastic “tropical design” strap, which is now a tropical style rubber strap, with polished steel buckle with “ORIS” engraving. While the strap is not made of expensive natural rubber, it is extremely soft and pliable. There is one downside to the strap: there are at least a few millimeters of extra space between the lugs and strap. It is a not a deal breaker and if you don’t like it you can buy an aftermarket strap, such as a Nato or leather strap. This is not a professional diver with a 300 plus meter water-resistance rating and helium escape valve. However, it is an ISO 6425 dive watch and it will work in virtually any aquatic environment other than saturation diving. Oris did an excellent job re-interpreting a timepiece from their archives by improving on all the areas that needed to be modernized while maintaining the look and feel of the vintage model. They got almost everything right on this one. Personally, I think this is one of the best values for a dive watch under two thousand dollars.